I’d like to leave Elder for a while to talk about other characters of the story. Astra is not the only, who got older. In Cassandra’s family there are some changes, too. She’s an elderly lady now. Her elder sons are teenagers. Her younger children (together with Malcolm) Casper and Cassy Landgraab also grew up a little. The advanced age requires an advanced hairstyle and Cassandra decided to get rid of girlish pigtails. And here’s the nightwear Mr Random suggested for him. Mr Random! Just you wait! You’re going to be fired! Astra comes to the Landgraabs to do some sad duty. She brings Malcolm to his family. -Thank you, Cassandra, for the son and the daughter. -You know, I’ve always loved your boys as my own sons. But I’m glad to have a heir of my own blood. -Take care of your Mom, Casper. The Bears keep going to work and getting promoted. Goldilocks keeps treating dearest and nearest, young and old. 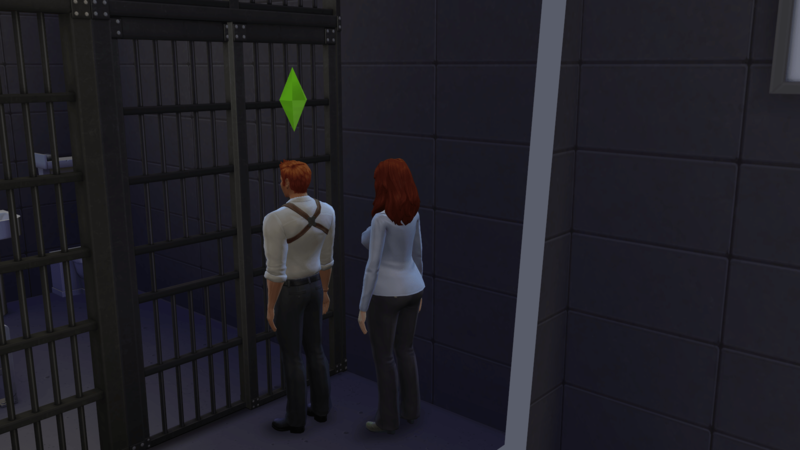 Malcolm Landgraab comes to the police office to tell Junior that his house was robbed. -Have you seen the robber? -Yes, she ran towards the gym. -Don’t worry. We’ll help you. -Shame on you! How could you harm a poor ghost?! After solving the crime, Junior was promoted to colonel. To remember this event he takes a selfie with his friend. Posted on May 8, 2016 by chealsycatPosted in Goldilocks and Bears (Sim fairy tale)Tagged #Goldilocks and Bears, #Sims 4, bears, Goldilocks, Sims.